The increasing popularity of SCUBA diving and growth of commercial diving has increased the incidence of decompression illness (DCI). As more people of varying ages and fitness dive more often, helped by developments in technology to go deeper and for longer, then doctors will see more cases of this condition. 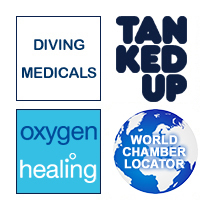 At our Hyperbaric Chamber in the Midlands we see many cases of DCI in divers who have observed all the rules and stayed within their tables or computer algorithms, but still develop DCI. No diver, diving school or independent instructor should think that they are immune to DCI. Here we explain how it can develop, how it is diagnosed and how it is treated. Direct effects of increasing pressure occur only on the gas filled spaces in the body. The human body is primarily made of water, which is non-compressible and transmits pressure evenly. However, the gases in hollow organs - lungs, middle ear, sinuses, poorly filled teeth, bowels, and those dissolved in the blood - are at the mercy of pressure changes. The physical behaviour of gases is governed by the following 3 gas laws. They define the physics and problems involved in descending and ascending in water. To understand how DCI can occur and how it is treated, a diver needs to understand these 3 laws. The volume of a given mass of gas is inversely proportional to the pressure being exerted on it (temperature remaining steady). For every 10 metres of descent the pressure increases by one atmosphere (atm). Therefore, total lung volume during a breath-hold dive at 10 metres is one-half that at the surface. At 20 metres it is 1/3, at 30 metres it is 1/4 and at 40 metres it is 1/5. On surfacing these figures are reversed. However when breathing compressed gases as in diving the mass of gas in the lungs is increased to fill the normal volume. An ascent from 30 metres to the surface without venting (exhaling) would cause the gas, in already full lungs, with minimal ability, to expand further to increase its volume to three times normal with the greatest change occurring in the last 10 metres where it would double. This is the key law to explain pressurisation and depressurisation issues and injuries. As a diver descends the total pressure of breathing air increases in accordance with Boyle's Law; therefore, the partial pressures of the individual components of the breathing air are increased proportionally. As the individual descends deeper under water, nitrogen dissolves in the blood and is carried to all body tissues until a new equilibrium is reached. Long before this however Nitrogen at the higher partial pressures in blood alters the electrical properties of cerebral nerve cell membranes, causing an anaesthetic effect termed nitrogen narcosis. For every 15 metres of depth this is roughly equivalent to one alcoholic drink. At 50 metres divers may experience alterations in reasoning, memory, response time, and other problems such as idea fixation, overconfidence, and calculation errors. With increasing depth, nitrogen in compressed air equilibrates through the alveoli of the lungs into the blood and thence into the tissues. Over time nitrogen dissolves and accumulates initially in the mainly aqueous tissues or those with a high rate of blood flow e.g. the brain, and progressively in the lipid or fatty component of tissues. On longer dives some or all tissues become 'saturated' and will not take up any more nitrogen. As an individual ascends, there is a lag before saturated tissues start to release nitrogen back into the blood. It is this delay that creates problems. When a critical amount of nitrogen is dissolved in the tissues, reduction of pressure caused by ascending induces the dissolved gases to 'outgas' and form small but myriad bubbles in tissue cells, tissue spaces and blood. Ascending too quickly causes the dissolved gases - nitrogen - to return to gas form more quickly increasing the number and size of the bubbles and while still in the blood or tissues causing local damage which may be felt as symptoms of DCI Further reductions in pressure through flying or ascending to a higher altitude also contribute to bubble formation. The average airline cabin is pressurised only to 8000 feet or 0.8 atm. If a person flies too soon after diving, this additional decrease in pressure may be enough to precipitate bubbling or enlarge any bubbles already in existence. With or without the effects of flying If the bubbles are in the blood in some divers paradoxical embolisation may occur through a PFO.